Friday I did something I've been wanting to do since I started forageSF, I went hunting....well, seeing as I didn't have a gun, or a hunting license, I suppose hunting wasnt exactly what I did. To be more exact, I went on a hike with some people who were hunting. Just so you don't get excited, just to be let down, we didn't get anything. We actually didn't even see any in season animals until we were riding home in the car (one of my blood thirst comrades was close to jumping out of the moving car). In a lot of ways it was hunting though. It was hunting in the way that I felt when I was in the forest. I talk a lot about the way knowledge of wild food changes the way you experience nature. That it gives you a new connection with your environment, and an awareness that a simple walk in the woods doesn't necessarily attain. Its was the same way on friday, but magnified. We woke up at 3:30am to drive to Napa ( a friendly vineyard owner had given us permission to hunt on her land). As soon as we entered the woods, it was in a different way than I've even done so before. I could hear everything. The rustle of a salamander crawling across our path at 10 ft pounded my eardrums. I walked with a quietness and awareness that I've really never felt before. Even though I wasn't going to shoot anything (hunting license issues), I still felt it. That higher awareness of "getting your eyes on" that we talk about with mushroom hunting. A focusing of the senses, hearing and seeing with an awareness that many of us never experience. I of course don't miss the irony that this awareness comes at the cost of killing something. That the connection to my environment is attained through death. This doesn't bother me though. We are animals, and animals survive off other life forms. Be it a carrot, an apple, or a pig. One doesn't have more or less value over the other, and the "nothing with a face" argument has always struck me as strange. I will hunt again. I will hunt because I like to eat meat. Because I feel like hunted meat is one of the most honest meat to eat, but also to feel the awareness again. The fine tuned sense of place that comes with hunting. This is the recipe I made for the last Wild Kitchen. It takes a bit of time, homemade beef stock and all, but we're all about slow food right? This is a really amazing soup. 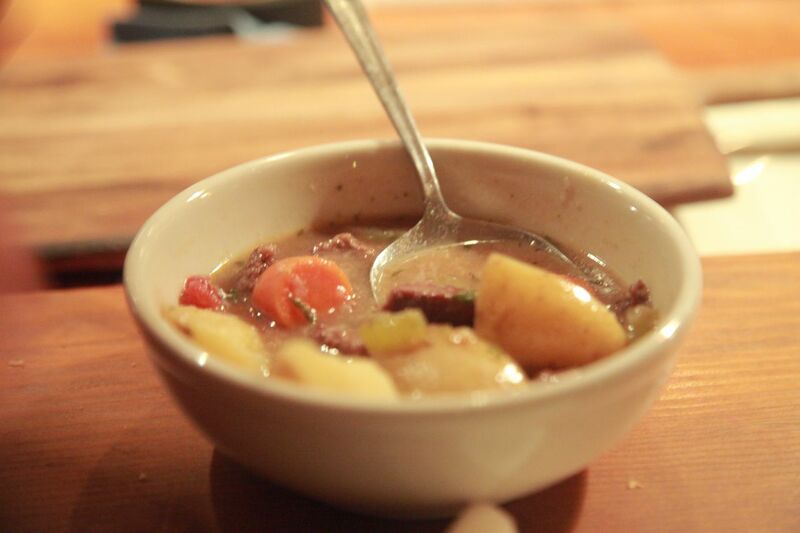 Long cooking makes the venison very tender, and the addition of fresh stock gives it a deep complex flavor. I saved what we had left from the dinner (mostly broth), in canning jars in the freezer. I defrost some over rice and heat it up, it's pretty great just like that. Wash and thoroughly dry the venison, then roll it in a mixture of flour, salt, and pepper. Heat a large pot over high heat, then add the oil. When it is hot but not smoking, sear venison in batches until browned, 2-3 minutes. Don’t crowd the pot, or the meat will stew instead of searing. Remove the meat then add the onions and saute until they begin to color. Add the celery and carrots. Season with salt and pepper. Saute for 2 minutes. Add the garlic, tomatoes, basil, thyme, and bay leaves to the pot. Season with salt and pepper. Deglaze the pan with the red wine. Add the beef stock, and bring to a boil. Reduce to simmer, and cover. You'll want to Simmer the stew for 1-2 hours, or until the meat is very tender. You can add more stock if it evaporates too much. Add potatoes about 1/2 hr before soup is done, so they don't overcook. I find this stew is really better the next day. Reheating deepens the flavors, and gives the meat more of a chance to tenderize, but it can be served immediately as well. Enjoy! Rough chop carrots, celery, and onion. Put the bones, onion, and carrots, into a shallow roasting pan, then cook about 30 minutes, or until the bones are browned, and the onions start to carmalize. Pour off the excess fat and place bones and veggies in stock pot. Pour 1/2 cup red wine into roasting pan and deglaze over medium heat, scrape bottom of pan, and pour this into stock pot. Then add the bayleaf, celery, thyme, and garlic to pot. Add 12 C water, bring to a boil, then reduce to a simmer, cover, and skim fat regularly. Cook for as long as you can, I like to cook it for 8 hours, but 5 works. Strain stock, discard veggies and bones, allow stock to cool 20 minutes. If you are going to use stock immediatly, put in fridge to allow fat to settle, then skim off. Otherwise, put stock into pint ball jars with the fat on top, this helps the stock to keep. The stock will keep for about a week in fridge, months in the freezer. Use it in any soup with beef or venison, or cook it down to make an amazingly concentrated sauce.